Read this short guide and learn how to do basic tasks with the Ozeki Phone System XE, from your C# .NET application. This guide explains how to receive and make voice calls, how to send and receive SMS messages and helps you get started to build more advanced projects. C:\Program Files\Ozeki\Ozeki Phone System XE\Examples.NETAPI\OPSSDK.dll). 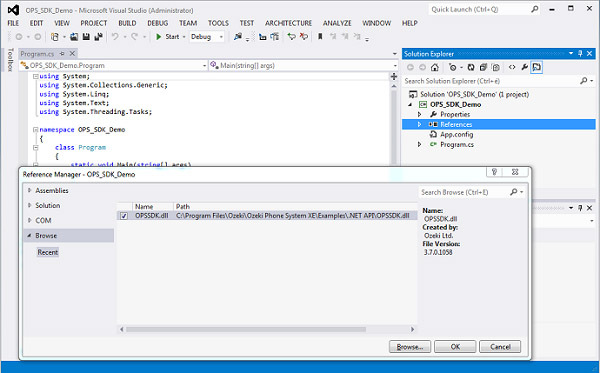 After OPSSDK.dll has been added, it will appear in the references section of your project (Figure 2). You need to create a new instance from the OpsClient type then login to your Ozeki Phone System XE. To sign in, you need to specify the IP address of the server (on which your PBX has been previously installed), your username and the corresponding password. The return value of the Login function indicates whether the login was successful or not. After that, you need to get an API Extension with the GetAPIExtension function, which needs one parameter, the identifier of the extension. If this extension does not exist, the GetAPIExtension function will return null. If the extension exists, you can subscribe to the IncomingCall event of the API Extension. In the event handler you can access the call object in the VoIPEventArgs<ICall>'s Item property. Now you can accept, reject or forward this call object with the appropriate function. In addition, you could subscribe to the events of this object and many media handlers (MediaHandler) can also be attached. You need to create a new instance from the OpsClient, then login to your Ozeki Phone System XE. To sign in, you need to specify the IP address of the server (on which your PBX has been previously installed), your username and the corresponding password. The return value of the Login function indicates whether the login was successful or not. After that, you need to get an API Extension with the GetAPIExtension function, which needs one parameter, the identifier of the extension. If this extension does not exist, the GetAPIExtension function will return null. If the extension exists, you can create a call through the API Extension. For this, you need to use the CreateCall method, then subscribe to the events of the call. The CallStateChanged event indicates that the call status has been changed. You could get the actual state from the EventArg's Item property. The CallErrorOccured event shows that an error has occured. Many different media handlers can be attached to the call. By using the ConnectAudioReceiver method, you can attach a speaker, and the ConnectAudioSender method could be used to attach a microphone to the call. With the Start method you could start calling the callee. You need to create a new instance from the OpsClient, then login to your Ozeki Phone System XE. To sign in you need to specify the IP address of the server (on which your PBX has been previously installed), your username and the corresponding password. The return value of the Login function indicates whether the login was successful or not. After that, you need to get an API Extension with the GetAPIExtension function, which needs one parameter, the identifier of the extension. If this extension does not exist, the GetAPIExtension function will return null. If the extension exists, you can subscribe to the API Extension's MessageReceived event, which will indicate when a new message arrives. In the Message EventArg you can access the message content, or sender. // Here you could receive an EmailMessage, or an SMSMessage too. After that, you need to get an API Extension with the GetAPIExtension function, which needs one parameter, the identifier of the extension. If this extension does not exist, the GetAPIExtension function will return null. If the extension exists, you can subscribe to the MessageSubmitted and MessageDelivered events. The MessageSubmitted event will raise when a message is about to send, and the MessageDelivered event will raise when the recipient receives the sent message. To send an SMS message you need to create an SMSMessage object, where you can provide the destination and the message content. If you need to identify each SMS, you could do that with the SMS object's MessageId property. Finally, with the SendMessage method you can send the created SMS object to the recipient. //sms.MessageId will appear in the Submit and the Delivery report. 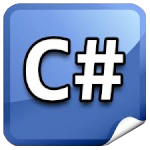 The Ozeki Phone System XE offers a lot more options for C#.net developers. You can interact with existing calls, control and configure the PBX, you can introduce new communication techniques and media formats.